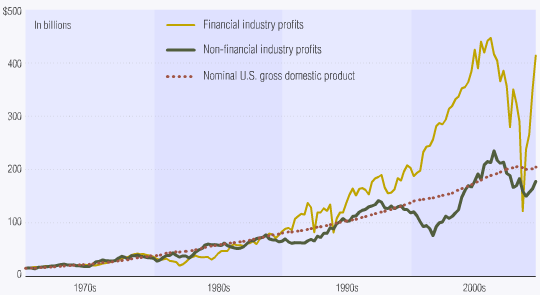 Does Easy Monetary Policy Enrich the Financial Sector? The first inkling I had that this could be the case was looking at the effects of quantitative easing (monetary base expansion) on equities (S&P500 Index), corporate profits and employment. 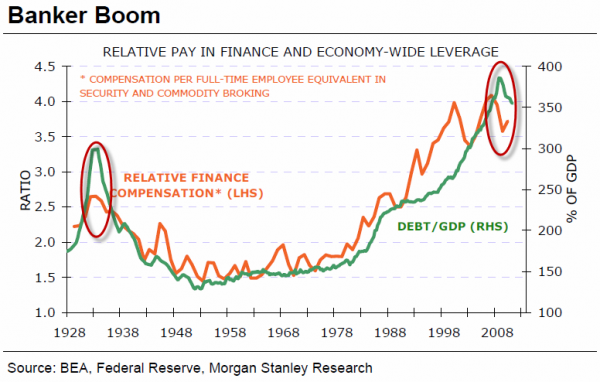 While quantitative easing has dramatically reinflated corporate profits, and equities, it has not had a similar effect on employment (nor wages). However there are lots other factors involved (including government layoffs), and employment (and wages) is much stickier than either corporate profits or equities. It will be hard to fully assess the effects of quantitative easing on employment outcomes without more hindsight (but the last four years does not look good). 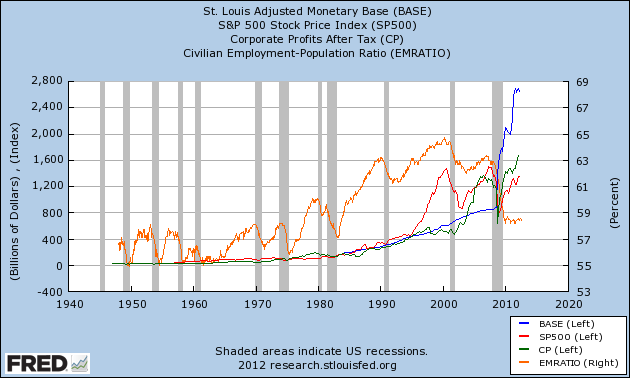 This disparity has not been driven by growth in the monetary base, which lagged behind until 2008. 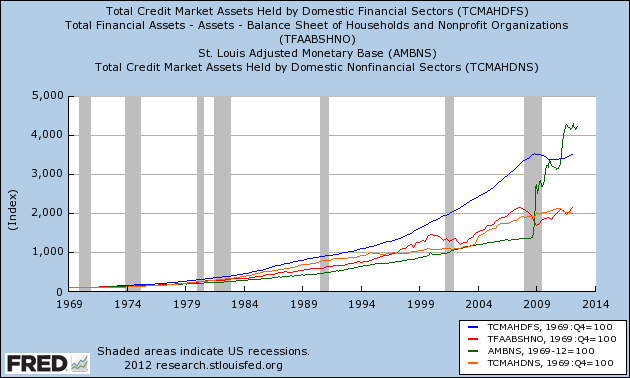 Instead it has been driven by other forms of money supply growth, specifically credit growth. 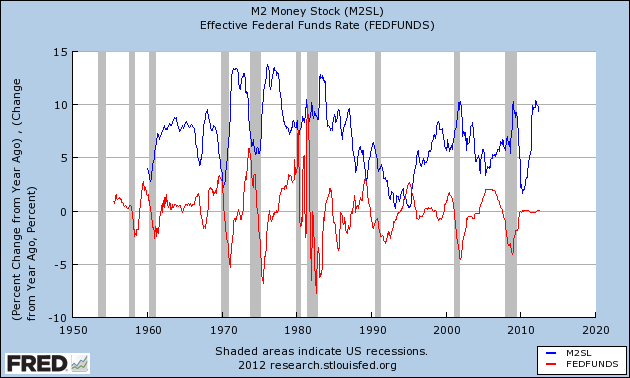 The extent to which M2 is driven by the Federal Funds rate (or vice verse) is not really relevant; the point is that the Fed’s chosen transmission mechanism is inherently favourable to the financial sector. The easing of credit conditions (in other words, the enhancement of banks’ ability to create credit and thus enhance their own purchasing power) following the breakdown of Bretton Woods — as opposed to monetary base expansion — seems to have driven the growth in credit and financialisation. It has not (at least previous to 2008) been a case of central banks printing money and handing it to the financial sector; it has been a case of the financial sector being set free from credit constraints. 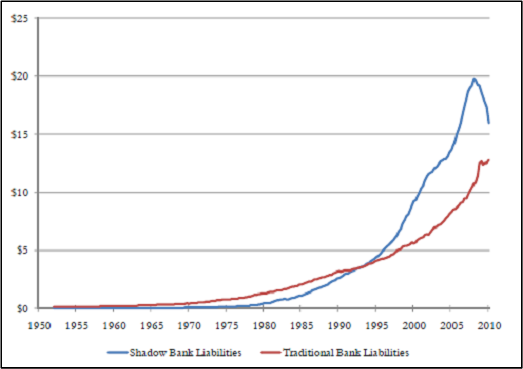 Monetary policy in the post-Bretton Woods era has taken a number of forms; interest rate policy, monetary base policy, and regulatory policy. 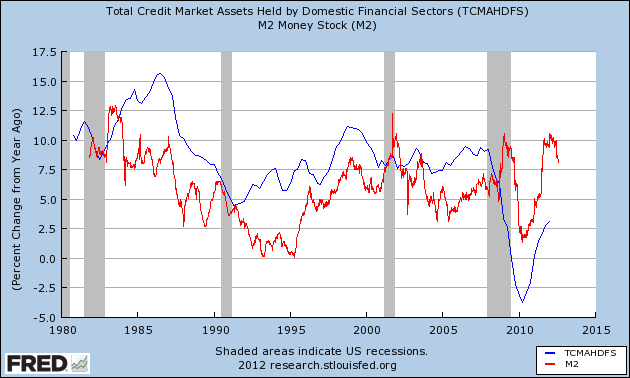 The association between growth in the financial sector, credit growth and interest rate policy shows that monetary growth (whether that is in the form of base money, credit or nontraditional credit instruments) enriches the recipients of new money as anticipated by Cantillon. This underscores the need for a monetary and credit system that distributes money in a way that does not favour any particular sector — especially not the endemically corrupt financial sector. This entry was posted in Economic History, Economics, Federal Reserve, Inflation, Wall Street and tagged cantillon effect, financial sector, intermediation, m2, monetary base, monetary policy, nonfinancial sector, shadow banking. Bookmark the permalink. It’s pretty clear that the financial sector is enriched when money is printed, as the financial sector and political sector has first dibs on the newly created money. The only time when they might be less enriched would be in the end game of the nightmare of hyperinflation where fiat currency is destroyed. Quantative easing is a tax on everyone holding that currency. The hidden taxation is subtly extracted from the pockets of every citizen but flows chiefly to the benefit of those in the financial and political sectors. Their rewards are so large that they don’t care about the effects, such as price rises across the board in food for example. They are content to let others far more vulnerable experience the consequences and worry about their plummeting standard of living. Very well stated. We always have to remember that the fed is the big banks, the first to get the money. This really is just another astoundingly clear display of the brilliance of this blog, not least it’s author! Pingback: Yes » Why Aren't You Outraged? You should be a Criminal Lawyer John. The evidence is compelling. So when does the public trial begin? It is clear as day now. Do people with an interest in justice take these matters further, such as a public petition? How do we simplify to gain greater public understanding? The economy is teetering now so if matters get worse, people will demand answers. it has to be simple and use visual imagery. Who bought stocks at the bottom of the market March 2008? Who knew about the Fed support in advance. Why did Bernanke announce the first “Green Shoots” Who shorted the market to push the average investor out of the market at a low point? 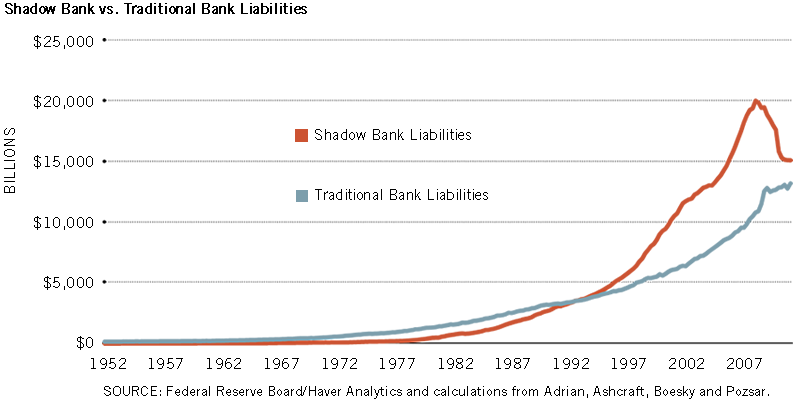 Who made the gains at the expense of the average Joe who had their life savings in the market. These are the next investigations. Who has this ability to connect the dots. Serial psychopaths who fleece people are not worthy of their freedom. Can somebody forward this to the FED? Or, do they already know? John, now it sounds like you are 25. This is not the way that the world has ever worked. Groups are in existence to secure an advantage for themselves. hopefully, this crisis will once again show people the dangers of banking. What does John’s age have to do with anything? I was 23 when I spotted the US housing bubble! Ben Bernanke and the FED didn’t spot the bubble for another 4 years. I still wonder (no I don’t) how I used fundamental analysis to easily uncover the bubble while the TPTB did not. We could go on and marvel at the writings of this man, who believes, that printing money to buy up the previous bad debts would somehow erase/ease the pain. PS Groups always try to seek an advantage! Enlightened groups come to the realization that the game of life is not a zero sum game. Both you and I can succeed together. It doesn’t have to be winner takes all. I said there was a need. I never said it would be fulfilled. Please inform your networks about this and encourage your representatives to support it, to avoid falling off the looming cliff, and any more cliffs. Quite interesting that these Bills are being promulgated and promoted. So this means the USA is actually going to split down the middle? Partisan politics, Keynesian/Austrian, Statist/Libertarian ideology is now having a duel. So if I created a new country under International Law (Think Kosovo), I could in theory use Monopoly Money as the national currency. I could hand out this Monopoly Money to all my cronies on John’s Blog. You could use these notes to swap with people with a lower IQ for real assets. We just need to have a sufficient Military backing up this Monopoly money in case anybody with a higher IQ asks questions. Does anybody know where we can get a really smart Physicist?